Windows 10 Spring Creators update brought in a number of improvements to enhance our experience. Along with these bunch of awesome design tweaks and a fresh coat of paint, Windows also put in some effort to improve Edge browser. We’re aware that Edge finally offers the ability to mute specific tabs, but that’s not pretty much it. Apart from this, here are a few more additions how Edge browser just got better with Spring Creators update. With these useful additions Edge has finally managed to catch up with Google Chrome and Mozilla Firefox. Don’t believe us yet? Let’s discuss about each feature in detail. Yes, you know the drill! Muting tabs feature has finally arrived on Edge browser which is one big relief. So, to mute a tab on Edge, tap on the speaker icon on a noisy tab. This will automatically shut off whatever audio it is playing and block all kinds of notification sounds. To unmute it, tap on the same icon again. Another major relief which Edge browser brought for us is Autofill forms. Chrome and Firefox support this feature since a long time, and now finally Edge seems to have caught up as well. To access the new Autofill settings section on Edge browser, head on to the Settings panel, scroll down and click the View advanced settings button. Here you can customize the Autofill settings for websites and manage passwords too. We really appreciate Edge to introduce this long-awaited feature. Apart from this, Edge will also store your credit card information for easy access. But yes, the security code will not be saved to prevent any sort of unauthorized access. Remember that clumsy side panel which slided in from the right window? Yes, that narrow column which included all our Favorites, Reading Lists, Bookmarks, history, downloads and more. Well, the good news is that this column is now far bigger and better, and much easier to use. It also includes a “Create new folder” button, which was hidden behind a right-click contextual menu in previous versions. With the help of this option you can easily keep all the content in specific folders say Sports, Entertainment etc. While surfing on web browsers, hitting the F1 key usually opens the webpage in full screen mode. Well, the previous version of Edge was a bit of a disappointment in this case. It displayed three action buttons on the top-right corner which included, minimize, exit full screen mode and close window options. So, in case you wanted to switch tabs while working we had to first exit the full screen mode and then do it. But now with Windows Spring Creators update Edge has overcome all such shortfalls. 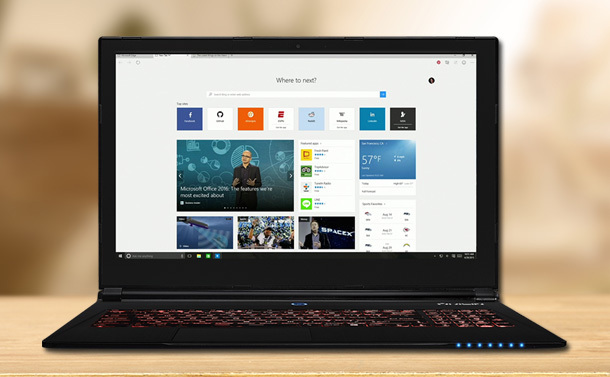 It now offers a proper full screen mode just like other web browsers which include all open tabs, URL bar, minimize window, exit full screen option and close window option. Printing web pages on Edge just got better! Now if you wish to print any webpage from Edge, it won’t print an ads or images. By using the “Clutter Free Printing” option you not just save a lot of paper, but also print an easy to read text. To use this option, hit the Control+ P button and then tap on “Clutter Free Printing” to print a text only version of a webpage. So folks, here were a few ways how Edge has finally managed to catch up pace with other browsers. These are a bunch of thoughtful tweaks introduced by Windows to improve our browsing experience. We hope to see more of such useful additions in future!